Through successive editions, Management and Welfare of Farm Animals has gained international recognition as a classic introductory textbook for students of agriculture and veterinary science. 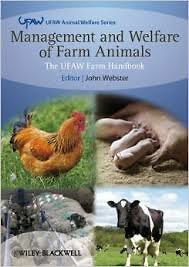 Conceived by the Universities Federation for Animal Welfare (UFAW), the book has always sought to promote the humane treatment of livestock within the practical business context of modern farming. Now fully revised and updated, this fifth edition remains the most comprehensive and accessible guide available. Three animal groups appear here for the first time (game birds, South American camelids, and ostriches), and a chapter on horses has also been restored. Throughout, the book offers clear advice for the humane management of all major farmed species in the primary context of large-scale food production. However, this edition also takes full account of consumer demand (and legal requirements) for alternative farming methods and enhanced welfare standards, whether in conventional agriculture or the smallest of hobby' farms. Brand new chapters reflect fresh understanding of welfare science, ethics, and the role of society in ensuring the best possible farm conditions. It remains an indispensable resource for students, and for all those seeking to promote animal welfare.